Museums have always been an amazing place to visit for the people of all the age groups. Right from the children to adults, everyone feels excited to get into the museum as there are end numbers of things to explore. But sometimes people tend to leave certain areas of the museum. Why worry when the technology has the easiest solution! Yes, you got it right. Technology has changed the ways people engage with exhibits. A mobile application can help the museums to connect with their audience and help them view the museum collection online which includes the art, sculptures, paintings and so on. The apps typically focus on the museum’s entire collection and enable the audience to browse and obtain information on the featured collection. We came to a conclusion on how a mobile application can help the museums to stay in touch with their audience and so keeping this in mind, we have developed many mobile apps for museums which have benefitted them enormously. The apps work on Android, iPhones, iPads and Tablets. Your audience can easily search for collections by Artists, Categories, Culture and more. Even if the user is not in the museum he/she can get the detailed description and other information on the artifacts. The mobile app will have the ability to push items into Favorites list which can be stored for later. The user can easily recall the Favorites and can also add or remove the already short-listed items. 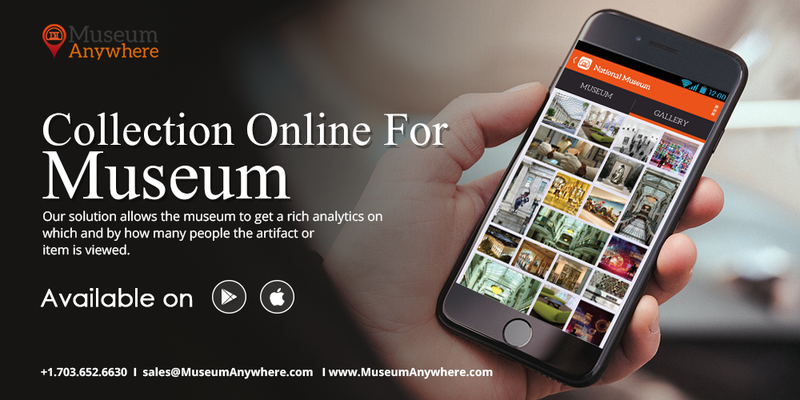 Your audience can view your museum collection online across the globe anywhere and at any time as it is pocket-friendly. Your audience can easily share the images of the art or paintings with the art and museum lovers on the social media (Facebook, Twitter and Instagram). So if you are planning to get a mobile application developed for your Museum, we will assist you. At Museum Anywhere, our solution integrates with your TMS Collection Systems. If we do not have the integration to another Collection system that you use, we will build that for you. Museum Collection App will be placed in Apple App Store and Google Play Store for free download by the public.